This document was published by the Timed Text Working Group as a Proposed Recommendation. This document is intended to become a W3C Recommendation. The W3C Membership and other interested parties are invited to review the document and send comments to public-tt@w3.org (subscribe, archives) through 08 April 2016. Advisory Committee Representatives should consult their WBS questionnaires. Note that substantive technical comments were expected during the last Candidate Recommendation review period that ended 28 February 2016. The implementation report documents that there is at least 2 independent implementations for every feature defined in this specification but not already present in [ TTML1 ], thereby satisfying the Candidate Recommendation exit criteria. A list of the substantive changes applied since the initial Working Draft is available. This document specifies two profiles of [ TTML1 ]: a text-only profile and an image-only profile. These profiles are intended for subtitle and caption delivery worldwide, including dialog language translation, content description, captions for deaf and hard of hearing, etc. This specification uses the same conventions as [ TTML1 ] for the specification of parameter attributes, styling attributes and metadata elements. In particular, Section 2.3 of [ TTML1 ] specifies conventions used in the XML representation of elements. Document Instances remain subject to the structural requirements of [ TTML1 ]. The ittp:aspectRatio attributes allows authorial control of the mapping of the root container of a Document Instance to each image frame of the Related Video Object. Otherwise, the root container of a Document Instance SHALL be mapped to the image frame in its entirety. In other words, tts:extent, when present on the tt element, determines the size of "px" units relative to the root container. ttp:aspectRatio is independently used to map the root container to each image frame of the Related Video Object. The ittp:aspectRatio parameter effectively defines the intended display aspect ratio (DAR) of the root container, while the tts:extent style property on the root element effectively defines the intended storage aspect ratio (SAR) of the root container. A 16:9 video program is authored to ensure adequate presentation on 4:3 display devices using a center-cut. Accordingly subtitle/captions are authored using ttp:aspectRatio="4 3", allowing the combination to be displayed on both 4:3 and 16:9 display devices while preserving both caption/subtitles content and the relative position of caption/subtitles with video elements. A playback system zooms the content of example (a) to fill a 21:9 display, perhaps as instructed by the user. The system elects to scale the root container to fit vertically within the display (maintaining its aspect ratio as authored), at the cost of losing relative positioning between caption/subtitles and video elements. 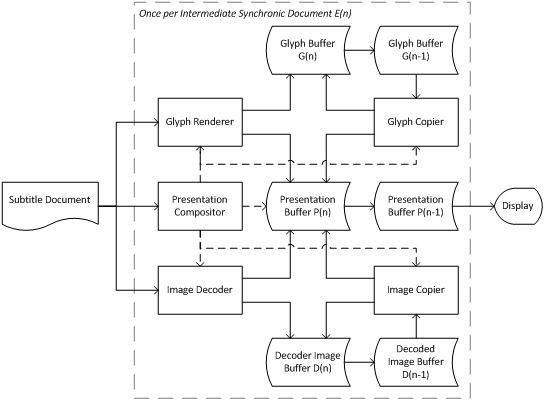 The system described in (b) instead elects to map the root container to the video frame, maintaining relative positioning between caption/subtitles and video elements but at the risk of clipping subtitles/captions. If and only if the value of displayForcedOnlyMode is "true", a content element with a itts:forcedDisplay computed value of "false" SHALL NOT produce any visible rendering, but still affect layout, regardless of the computed value of tts:visibility. All regions SHALL NOT extend beyond the root container, i.e. the intersection of the sets of coordinates belonging to a region and the sets of coordinates belonging to the root container is the set of coordinates belonging to the region. the Document Instance also conforms to [ ttml10-sdp-us ], in which case the ttp:profile attribute SHOULD NOT be present. [ ttml10-sdp-us ] requires that the ttp:profile element be present and that its use attribute be set to a specified value. See 4. Conformance for a definition of permitted and prohibited. For any content element that contains br elements or text nodes or a smpte:backgroundImage attribute, the begin and end attributes SHOULD be specified on the content element or at least one of its ancestors. The flow of text within a region depends the dimensions and spacing (kerning) between individual glyphs. The following allows, for instance, region extents to be set such that text flows without clipping. NOTE: This is consistent with [ ST2052-1 ]. #extent-region permitted The tts:extent attribute SHALL be present on all region elements, where it SHALL use either px units or "percentage" syntax. smpte:backgroundImage MAY be used according to 8.3 smpte:backgroundImage Constraints with the semantics of the attribute defined by Section 5.5.2 of [ ST2052-1 ]. This Section specifies the Hypothetical Render Model illustrated in Fig. 1 Hypothetical Render Model . Whenever applicable, constraints are specified relative to root container dimensions, allowing subtitle sequences to be authored independently of Related Video Object resolution. BDraw effectively sets a limit on fillings regions - for example, assuming that the root container is ultimately rendered at 1920×1080 resolution, a BDraw of 12 s-1 would correspond to a fill rate of 1920×1080×12/s=23.7×220pixels s-1. where CLEAR(E0) = 0 and CLEAR(En | n > 0) = 1, i.e. the root container in its entirety. To ensure consistency of the Presentation Buffer, a new intermediate synchronic document requires clearing of the root container. For a region Ri in with tts:extent="250px 50px" within a root container with tts:extent="1920px 1080px", NSIZE(Ri) = 0.603. Setting a Normalized Glyph Buffer Size effectively sets a limit on the total number of distinct glyphs present in any given intermediate synchronic document En. For example, assuming a maximum Normalized Glyph Buffer Size of 1 and the default tts:fontSize of 1c are used, the font size relative to the root container height is 1/15 , and the maximum number of distinct glyphs that can be buffered is 1÷(1÷15)2=225 glyphs. GCpy effectively sets a limit on animating text. For example, assuming that the root container is ultimately rendered at 1920×1080 resolution and no regions need to have background color painted (so only a CLEAR(En) operation is required for the normalized drawing area for the intermediate synchronic document), a GCpy and BDraw of 12 s-1 would mean that a group of 160 glyphs with a tts:fontSize equal to 5% of the root container height could be moved at most approximately 12 s-1 ÷ (1 + ( 160 × 0.052 )) = 8.6 times per second. Ren(Gi) effectively sets a limit on the text rendering rate. For example, assuming that the root container is ultimately rendered at a 1920×1080 resolution, a Ren(Gi) of 1.2 s-1 would mean that at most 120 glyphs with a fontSize of 108 px (10% of 1080 px and NRGA(Gi) = 0.01) could be rendered every second. Fig. 3 Illustration of the use of itts:forcedDisplay below illustrates the use of forced content, i.e. itts:forcedDisplay and displayForcedOnlyMode. The content with itts:forcedDisplay="true" is the French translation of the "High School" sign. The content with itts:forcedDisplay="false" are French subtitles capturing a voiceover. The following sections define extension designations, expressed as relative URIs (fragment identifiers) relative to the IMSC 1.0 Extension Namespace base URI. Note that the ttp:profile attribute is not allowed by [ EBU-TT-D ], and the ebuttm:conformsToStandard element is used instead to signal Text Profile, as specified in 6.9 Profile Signaling. Line-21 Data Services, ANSI/CEA Standard. Digital Television (DTV) Closed Captioning, ANSI/CEA Standard.